The architecture is lovely along the Camino de Santiago in rural Spain. But every so often even the medieval stonework must take a back seat to the stunning display of the heavens. On this day, we found shelter just in time. Thunder boomed and lighting and hail fell with fury. The art of pilgrimage is not easily learned. It involves a journey, most certainly, but not the journey of a tourist who seeks to appease the gross senses only. The pilgrim seeks to satisfy a deeper longing, the need to find his/her place in the world. If you are interested in exploring past, present, and future in land of the Bible email me at markziese@gmail.com or consider joining an excursion listed here. As a whole, the country of Spain is old, dusty, and crackled. Average rainfall across the peninsula measures about 25 inches annually, comparable to the state of Nebraska. Of course, proximity to the sea, elevation, and other factors fudge the numbers and create local variations of temperature and precipitation. Water from the sky must be augmented with irrigation efforts in order to meet modern agricultural demands. For this reason, canal systems to transport/distribute this life-giving moisture are common. In the Meseta, Spain’s inner plateau, these systems crisscross the surface of this baked anvil. While walking alone on the Camino de Santiago the trinkling sound of the water makes for pleasant company. I snapped this image near the village of Villavante. Our next adventure in the land of the Bible is slated for March 12-23, 2019. We’ll be doing a study-tour with Master’s-level students in Johnson University’s residency program. I’m already excited. Student trips are always fast-paced, high-energy, and full of great conversation. This may be the border between France and Spain. There were no signs. There were no guards. There were no lines. There was no passport control. Actually the only thing that went through my head when I took this picture was “cool cattle guard.” It was only later, as I was trying to figure out when I passed the international boundary, that I reckoned it must have been here. It may have been somewhere even less noticeable. The line between these two countries was established in 1659. As members of the EU, France and Spain are practicing the dream of the borderless Europe project (admittedly, not without wrinkles). History teaches that walls and fences are ineffective in shutting down the flow of illegal immigration. What works? Cooperative engagement between prosperous and liberal societies who require and enforce clear rules. We have many travel experiences planned for 2019 (see list here). These are organized on behalf of educational institutions or church groups. If you are a leader who is interested in crafting a unique travel opportunity for your organization or if you are an individual who would like to join a group, shoot me an email at markziese@gmail.com. Over the course of the last few days we have been thinking about the monuments in northwest Spain known as the cruceiro (see here, here, and here). The one pictured here rises near the lighthouse on Cape Fisterra. It overlooks the crashing waves of the Atlantic Ocean as well as the zero-marker for those following the Camino to this cape at the “end of the world” (more on this another day). A Portuguese inscription on the pedestal of this cruceiro reads, “CRUZ DA COSTA DA MORTE 1987.” It is a “Crucifix of the Coast of Death 1987,” a recent addition to the assembly of wayside crosses in the Galician hills. We have many travel experiences planned for 2019 (see list here). These are often organized on behalf of educational institutions or for church groups. If you are a leader who is interested in crafting a unique travel opportunity for your organization or if you are an individual who would like to join a group, shoot me an email at markziese@gmail.com. Yesterday I shared an image of a Galician cruceiro from Sarria (see here). While it communicated the texture of the granite from which the crucifix was cut and the iconography of the Christ and Mary figures upon it, it did not capture overall sense of the monument. I came across this more austere presentation in the town of Portomarín, Spain. It was standing in the courtyard outside the apse of the Iglesia de San Xoán (see our image of the church here). This shot captures the feature design of the traditional Galician cruceiro from ground to sky. At the bottom is the platform and pedestal. Rising from this is the shaft. Atop the shaft is the crucifix. As in Sarria, Christ and Mary are pictured on the crucifix, facing opposite directions. It is tall and slender: perhaps four meters in height. While no one knows for sure how many cruceiros have survived the ravages of time and traffic in this region of northwest Spain, one estimate suggests there may be as many as 12,000 still standing (see here). Note the lovely red flower someone left on the base. The monumental public crucifix or cruceiro (pronounced “kroo-THAY-EE-roe”) is a regular feature the Galician landscape. You can find these slender towers in church courtyards, busy intersections, or windswept hills. They are typically cut from granite and date to the period between the 16th and mid-18th centuries. Some are just a simple and empty cross; others are adorned with figures like the one pictured above that I found in the town of Sarria, Spain. On one side is the crucified Christ. On the other is a figure of the Virgin Mary. The steeple of the Church of Santa Mariña de Sarria rises in the background. The prompts behind these monuments are many. One is tied to a Catholic belief that time spent in purgatory may be redeemed by pious works. This dogma was famously defined at the fifth session of the Council of Trent in the year 1546 (see here). Erecting a cruceiro was seen as a way to earn indulgences for loved ones or for self. Similar stone crosses are found on waysides in France and Belgium. There they are known as calvaires. Bob inspects a water fountain along the road into Pamplona, Spain. Drinking water is readily available along the Camino. We filled our bottles from open fountains like this each day. Fountains without signs or fountains marked agua potable are safe for drinking. Only occasionally did we find a dry fountain or one marked non potable. Not once in five weeks of hiking in France and Spain did I struggle with the ol’ traveler’s malady. Of course, going into it with a gutfull of bacteria from the Middle East is pretty good prep. The Sea of Galilee is at the end of our journey as we hike the Jesus Trail in January, 2019. Following our hike we’ll head south for a quick visit in Jerusalem and Bethlehem. You are most welcome to join us, but realize that the window for signing-up is closing very soon. Click here for more information or email me directly at markziese@gmail.com. With all the fine eats in Spain, you wouldn’t really go to Burger King for lunch, would you? There is some pretty good eats in Israel-Palestine if you know where to look. We’ll be walking across Galilee in January of 2019 and aim to find some local food. Stops include Nazareth, Cana, Magdala, and Capernaum. Click here for more information or email me directly at markziese@gmail.com. We posted some details about Saint-Jean-Pied-de-Port, France in our most recent story-of-the-week (you really should check it out here). It is a beautiful mountain town located in the shadow of the Pyrénées, just a few miles from the Spanish border. The 17th century Mendiguren Citadel crowns one hillside overlooking the village. The most celebrated gate of the citadel is the one pictured here. Porte St-Jacques, or the “Gate of Saint James,” is a UNESCO World Heritage Site. It is a significant feature of the Santiago de Compostela and marks a first engagement with this historic trail for many pilgrims. The synagogue of Capernaum, Israel is a prominent feature of the Jesus Trail. We’ll be walking this historic trail in January of 2019. Stops include Nazareth, Cana, Magdala, and Capernaum. If you are interested in joining us click here for more information or email me directly at markziese@gmail.com. But move quickly, the window for signing-up is closing soon. A quiet road under the morning light stretches between the village of Hontanas and the ruins of the Convent of San Antón. The Spanish Meseta is an appropriate place to remember an Epiphany blessing by Jan Richardson titled, "For those who have far to travel.” It works on the Camino, at home, or in the Christmas story. Might never dare the first step that propels you from the place you have known toward the place you know not. As it comes into our keeping step by single step. To press on beyond distractions, beyond fatigue beyond what would tempt you from the way. before turning to go home by another way. You can find Jan’s webpage containing this poem here. It is not too late to sign on for our hike across Galilee (but it will be soon). This coming January we will be walking portions of the “Jesus Trail.” You are cordially invited to come along. Stops include Nazareth, Cana, Magdala, and Capernaum. Click here for more information or email me directly at markziese@gmail.com. Be sure to look up while exploring the nooks and crannies of the Cathédrale Sainte-Marie de Bayonne. The cut stones around windows and other openings are exquisitely decorated. Gothic-style demands a pointed arch (that sits nicely against the rib vaults that define the ceiling), but beneath that arch are circles or foils. These foils are perfectly symmetrical and contain still more overlapping circles that imitate leaves or cusps. The entire opening, often containing stained glass, is called a tracery. It is possible that this name comes from the work of “tracing” out the design on the floor. I scratch my head. I can hardly imagine the effort of the tracing—much less the work of shaping and stacking stone—to create this kind of visual display. The interior of the Cathédrale Sainte-Marie de Bayonne (in southern France) is fabulous. The exterior ain’t too shabby either. As described yesterday (see here), the complex is Gothic in its original design. However, the effort to complete it extended well beyond the 16th century, when the irregularities of the Gothic style gave way to the symmetry of Renaissance architecture. Here in Bayonne the steeples were the last of the pieces to rise, finished only in the 19th century. It is truly a multigenerational accomplishment. Note the row of flying buttresses between the cloister and the drip-edge of the nave. I shot this view to the steeples from the cloister that adjoins the cathedral. From above, the cloister is a perfect square; a grassy yard is surrounded by covered walks. That was convenient on this day. The rain began to fall from grey skies as Bob and I admired this triumph of stone and glass. The phrase “Gothic” often conjures up images of a post-punk subculture. Whether it be music or fashion, the term lends itself to all things dark, morbid, pagan, and probably lacey. All that goes out the stained-glass window when you stand in a Gothic cathedral. While the play of light and dark are part of the ambience, the architecture is nothing short of brilliant. What we call “Gothic” was “modern style” in 12th and 13th century France. This “modern style” came about as creative solutions to the engineering problems of heavy earthbound structures were explored. Flying buttresses and rib vaulting made it possible for medieval stonemasons to stack stones to to new and dizzying heights. Thinner walls meant more windows to welcome sunlight through millions of colored panes. A fun way to learn about the development of church architecture from the Romanesque to the Gothic style is to read Ken Follett’s 1989 novel, The Pillars of the Earth. But if you really want to experience Gothic for yourself, forget the music, the fashion, and the books. Visit a place like Bayonne, France. In the center of town you’ll find the Cathédrale Sainte-Marie de Bayonne. Stand in the crossing where the transept meets the nave and let your eyes soar! We are getting close to finalizing our Jesus Walk planned for January 2019. If you are interested, have a look at the link here. We’ll be trekking through parts of Galilee, experiencing hills and valleys, churches and ruins. At the end of the walk we’ll also spend time in Jerusalem and Bethlehem. Send any questions you might have to me at markziese@gmail.com. This town in southern France may have received its modern name from the Basques. They were the first to use the bayonet, a thrusting blade attached to the end of a firearm. It is possible that this musket modification was sharpened in this peaceful place, hence its name, Bayonne. Archaeologists have poked the ground here a few times retrieving coins, potsherds, and the remains of what was likely a small Roman fort built along the riverbank (for a POTD on the river and its folk in the time of Julius Caesar see here). Before it was Bayonne, the place was likely known as Lapurdum. Lapurdum is mentioned in the Notitia Dignitatum, a document that describes the Western Roman Empire in the early 5th c AD. At that point in history the region was writhing in the throes of crisis, overrun by Germanic tribes. In case you’re curious, the name of the region at that time was Novempopulania. Take a stab at pronouncing that one. We have a busy end-of-year scheduled for 2018 and an ambitious travel season planned for 2019. For a sample of what we are cooking, have a look here on our Explorer website. Know that it is often possible to join one of our groups even if your journey originates in a different place. Shoot me an email at markziese@gmail.com if you have questions. Why would a truck be sporting a shell? Obviously this is something we need to talk about. The River Adour is born in the snow of the Pyrénées and flows down to the Bay of Biscay. Here in Bayonne, France, it is broad and powerful. It surges under the bridge where I am standing and in just a few miles will mix with the salty Atlantic. In the Roman period this was the homeland of a salty people-group known as the Tarbelli. They called the river Aturis. Their land was desired for its gold. Strabo tantalizes us with the observation: you can pick up nuggets here "as big as a fist." They are easily found and require very little refining (check out this link to Strabo's Geography 4.2.1). According to Julius Caesar, the Tarbelli are one of several groups in Gaul that surrendered to Crassus in 56 BC and sent hostages to Rome (De Bello Gallico 3.27.1). All of these Gallic folk appear fussy and hostile, but much more human than the crazy Germans in the north. Eventually the Tarbelli were "Romanized" as a part of the province of Aquitaine. I posted another picture of Bayonne a while back. See here. This is your last call to join us for this year's cruise on the Mediterranean. We will be traveling by sea from Rome to Athens and back again. See the link here for details. Ports of call along the way include Sicily, Malta, and Santorini. If you are interested, you'll need to hustle. The Celebrity Reflection is about to sail! For explorers in the Basque region of France, the town of Bayonne figures into the plan. It is a local capital seated on the banks of the Nive and Ardour Rivers. Bridges lace the place together and give it a "little Paris" feel. The train station, pictured here, is often the first spot where the foot hits the ground. The Gare de Bayonne is a part of the late 19th century rail system that provides connectivity to the Bordeaux region (just to the north) and beyond. The facade and clock tower have more character than the interior of the station, but it gets the job done. Just in case you're interested Bayonne's sister city, Biarritz, is the surfing capital of Europe. Dude. I didn't see any boards on the train. If you are looking for an adventure-in-style, you should join Mark and Vicki for a Mediterranean cruise this October. See the link here for details. Naturally, we'll be visiting some sensational sites (like Athens and Rome) but we'll also do some fine dining. Did you know that cruisecritic.com calls our ship, the Celebrity Reflection, "a food-lovers fantasy"? That got my attention! This traditional soup of the Spanish highlands will fill your belly and stave off the Atlantic chill. What goes in the pot sounds like the old "stone soup" story: beans, potatoes, pork fat or sausage (chorizo), pork bones or knuckles, paprika, garlic, bay leaf, salt and pepper, etc, whatever. The one thing that is a must for honest Galician soup is turnip tops! I know you are thinking of lawnmower clippings about now, but it is truly tasty stuff, especially with toasted Italian bread for dunking. Galicia is located in the northwest corner of Spain. It takes its name from Celtic folk who settled there in the first millennium BC. Here's a recipe if you want to try Galician soup in your own kitchen (pull some turnips and poke the link here). Consider this your invitation to join us this winter in Galilee, Israel. We will be hiking the Jesus Trail between Jan 8-16, 2019. This trip is facilitated by the Jerusalem Center for Biblical Studies and is a bargain at only $2,588 from New York. For more details click here or contact me at markziese@gmail.com. How far in one day? It is tough to keep gravel on an 18% grade. Its tough to keep people on it too. Distance traveled per day for long-distance walkers in bible lands hinges on many things. Weather, slope, surface, health, and pack weight make a difference. Consider these estimates offered by experienced biblical scholars. Bob and Mark on their excellent adventure: Yup. We sweat a lot, don't have much hair, have large butts, short toes, springy ligaments, a windlass mechanism, upright balance, a brain that coordinates it all, . . . why, tramps like us were made for distance! Twenty miles is just getting started. Curious? Check this out here and here. Want to start 2019 in a unique way? 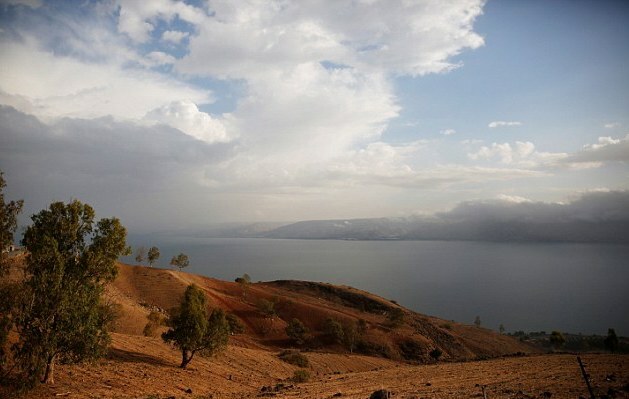 Join us for a walk across Galilee! Hike the Jesus Trail and do some additional sightseeing in Israel-Palestine. This trip is facilitated by the Jerusalem Center for Biblical Studies and is priced at $2,588 from New York. Dates are Jan 8-16, 2019. For more details click here or contact me at markziese@gmail.com. The morning meal of tortilla de patatas that I favored on the Camino Francés was not so popular in the northwest corner of Spain. I'm not sure why. I had to find other options. Toast a couple of hunks of bread. Smear with tomato jam (Portuguese Doce de Tomate). * Dip or sprinkle with olive oil (note the plastic sprinkle bottle with all the table essentials: salt, pepper, and olive oil). Augment it with a couple of thin slices of pork and a cup of cafè americano. Don't think toast and jelly. Think pizza. *See here for more on this Portuguese-style condiment. The cuisine in Israel-Palestine is Mediterranean in character but different from what I experienced in Spain and Portugal. If you are curious, why not join us for a walk across Galilee and do some additional sightseeing in Israel-Palestine? This trip is priced at $2,588 from New York. Dates are Jan 8-16, 2019. For details click here or contact me at markziese@gmail.com.